A full feature set for multisport athletes in an easy to wear design. The great battery life and support for smartwatch functions means you're fully informed whether that's on your daily activity or the specifics of your training. There's no altimeter and the use interface isn't the most logical, but it's a solid performer. The Garmin Forerunner family has always been a firm favourite with those who are a little more serious about their sport. Often the device of choice for runners and triathletes, there's now a wide selection of watches to track your every movement, whatever your activity. The Forerunner 735XT is designed with those multisport athletes in mind. It represents a solid choice in the line-up, especially if you can't stretch to the considerable asking price of the new Forerunner 935, which is, admittedly, the better overall device if you can afford it. We've been working out with the Garmin 735XT to see exactly what it offers and where it fits into the Forerunner lineup. The Forerunner 735XT swings in as an advanced sports watch, slotting into a position above the 600 series devices. The 735XT was the first Forerunner device to offer Garmin's Elevate wrist-based heart-rate tracking - and saw a major shift away from the chest-based heart-rate tracking that had dominated Garmin's previous devices. This was a big change in direction for Garmin, moving to compete with emerging rivals on a practicality level. Compact and reasonably slim, the 735XT offers both sporty looks with a degree of conventionality. Choose the black model and it's rather discreet, but for those who want a little more pomp to their sporty watch, there is a blue version with a strap that's a turquoise colour. Measuring 44.5mm in diameter, the 735XT isn't too chunky, although those with smaller wrists might find it a little on the large size. However, it's not big for the sake of being big - you will want that display space - and it's not overly thick, at just under 12mm. We've been wearing it for about a month and it's some way removed from the thickness of older Garmin devices, so it's an easy watch to live with. There are buttons around the 735XT's circumference and we've found we've triggered the start/activity button a couple of times by accident - it's just a little too easy to depress. Otherwise the buttons offer easy navigation through the user interface, although the hierarchy of the pages isn't always the most logical. For example, to access the menu you have to enter the activity area first and scroll down; however, there's a separate "options" menu area accessed with a long press on the up arrow for music control and clock options. This is one area that's different to the Forerunner 935 - which has a more logical navigation to the interface. Waterproofing is on board the 735XT, with 5ATM protection meaning you can wear the watch when swimming. Although if you want accurate heart-rate readings when swimming you'll need the HRM-Swim or HRM-Tri accessory straps. The 735XT's provided watch strap is comfortable, easy to adjust to the right tightness and, making this Forerunner a great watch to wear both for sports and for all-day tracking of your general activity. The hardware offered by the Forerunner 735XT gives you a full range of activity support. From the basic all-day activity tracker functions like step tracking and resting heart-rate reading, it's really the sports functions for which you should be buying this watch. With profiles for a whole range of sports like running, swimming, cycling and more, the "XT" in the 735's name is a reminder that this is a device designed specifically for multi-sport athletes, with support for triathlon, duathlon and even brick support, to make your racing and training easy to track. During use, tapping the back button during a multi-sport event will mark that stage as complete, breaking down swim-transition-bike-transition-run into pieces while you keep the timer running. The biggest challenge is likely to be remembering to hit the button on T1 when you've got plenty of other things to think about. In terms of hardware, it's the addition of the compass that sets the 735XT aside from the Forerunner 235 model. This adds the ability to have more accurate navigation, giving you point-to-point and real-time breadcrumb trails, along with the option to navigate back to the start of your route. There is no barometer, thermometer or gyroscope in the 735XT, which is what sets this watch a step down from the flagship Forerunner 935. There are some other features absent, like accumulated training load. You get a recommendation for recovery time on the 735XT, but it's not as considered as this feature is on the 935. The lack of barometer for accurate elevation changes is the biggest downside for this device - and the thing that cyclists will miss, as you'll be reliant on GPS elevation change measurements. The Forerunner 735XT can draw out a huge amount of data and present it in a meaningful way, the most important being the display during sport. With no touch supported, you're left to use the up and down buttons on the watch's left side to scroll through the screens, with all the important information easily accessible - speed, distance, time, pace, heart rate and HR zone - and laps automatically registered, or manually marked and all fully customisable. Any doubts about the performance of the Elevate wrist-based heart-rate tracker can be dispelled, as this is a consistent and reliable wrist-based system, with the BPM averages falling into the expected lines and readings matching our manual measurement of heart rate. As we mentioned, the watch also supports heart-rate chest straps from Garmin. We used the soft strap from our old Forerunner 610 and the performance in that case was seamless. It also supports ANT+, so can be paired with a wide range of accessories for your swim or cycle, for example, so you could add a cadence sensor too. The Forerunner 735XT also avoids some of the shortcomings we've seen on other wrist-based HR models: it reacts quickly to a change in pace and doesn't appear to suffer from spikes that produce extraneous results that we've seen from some. GPS route tracking is accurate, with the distances recorded falling close enough to the expected or map-measured readings, while GPS acquisition is fast, too - even on a cold start. Sometimes you might lose GPS reception under thick cover, but that's common to most devices. What we like the most is that on the run you can clearly see the information you want and these screens are customisable. There's support for a range of training options, with the watch offering intervals (that you can edit) and targets (speed, distance, pace or combinations - eeek - like time and distance), meaning you can test yourself at predicted race pace, or hit training targets. You can also create workouts on the Garmin Connect app and send these to the watch, with far easier control offered via the app's display. If there's a specific type of interval that you want, it's going to be easier to create that in the app than via the watch. You also get the performance condition feature, which measures your performance towards the start of your activity against your baseline averages and tells you how you feel. We love this, because it tells you that you're not feeling on top form and this run is going to hurt. Importantly (especially for multisport athletes who love to overtrain), it's a good indicator that you might need to adjust the intensity of your training. Sure, you can run through it, but let us not forget that rest is an essential part of any training programme. When it comes to battery life, the Garmin Forerunner 735XT will kick smartwatches to the dirt. The watch will work as a general activity tracker in daily use for easily over a week, while it will give you 14 hours tracking with heart rate and GPS. That's almost enough to see you through an Ironman (admittedly, we haven't tried this... yet). However, with regular workouts between 30 minutes to an hour spread across the week, we've still only had to change it once a week. This is via a crocodile clip charger and charging doesn't take long. Garmin hasn't ignored the looming spectre of the smartwatch, adding in various smart functions to its devices as wearables have evolved. The Forerunner 735XT will support smartwatch notifications and, once paired with an Android phone, this includes the full run of regular notifications - even if you can't really do anything with them. Unlike an Android Wear watch, you can't reply to messages or anything like that, but you are at least alerted so you can read those messages. You do have the option to answer calls, but this is really for those who have headphones on, because otherwise you'd be answering your phone in your pocket. You can supposedly control music (although we didn't manage to get this working) which will remote control music from your phone, rather than from the watch. That's a downside of the Forerunner compared to something like the TomTom Spark 3 - there's no option to load it up with music and connect your headphones. Garmin also supports a range of Connect IQ apps that you can access through the Garmin Connect app and install on your phone. This doesn't quite stretch to the wide support for apps you'll get on Apple Watch or Android Wear, but it does mean you have more integration with services or customisation options, so your Garmin isn't stuck as one device with a static set of features. The 735XT supports Garmin Connect Mobile, meaning the watch connects directly to your phone, without having to jump hoops through a PC (yes, TomTom, we're looking at you). The app holds all your details and exercise history, which can then be shared and connected with other services, like Strava, if you want to be cross posting your workouts there. Garmin Connect Mobile has become increasingly refined over the past year, moving from slightly archaic to much more modern, partly due to the lifestyle device explosion in the Vivo line, and a the need to stave off the likes of Fitbit and its easy-to-use app. You can customise what you're shown in Garmin Connect Mobile, although data fiends will still want to turn to the website version to get greater access to those big graphs and maps. One thing to note is that the data is syncing to the cloud and returning the results to your watch, so if you don't have a data connection on your phone, you'll find syncing is frustrating. But at least you can run your Garmin PC-free if you want. Garmin Mobile Connect can also give you the LiveTrack feature - which is great for cyclists - meaning you can share your ride on social media, or let people follow your progress. If you're heading out for a long ride, this might give peace of mind to family who can see where you are, without having to phone or message you. The Garmin Forerunner 735XT is an expensive device, but one that's tailored to support multisport athletes, so it's loaded with functionality for a demanding group of users. Even if you're not a triathlete, then this watch has some appeal over the lower-spec Forerunner 235, by offering a wider range of functions, without hitting the ultra-expensive Forerunner 935's price point. The Forerunner 935 is a slightly better device, however, offering a wider feature set and more hardware sensors for more data, plus a much better visual display and more refined user interface. That makes the 935 the better daily wear device, but for the extra £70, you might question whether that refinement is essential on top of the solid core that the 735XT offers. That's the important thing about the 735XT: it's fully-featured, offering modern convenience features like smartphone support, masses of data on your performance and condition, and it syncs reliably to Garmin Connect (so long as you can sync). The Garmin Forerunner 735XT has been available for some time and the advantage of that is you can now pick one up for a little over £300, making it a tempting proposition. 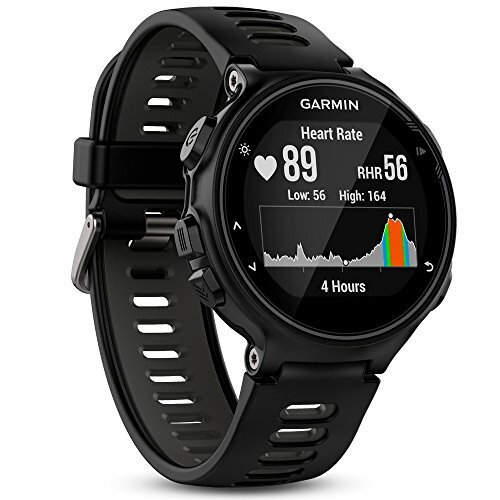 There is a lot of choice in the sports watch area, but if you're interested in performance and functionality, then this Garmin is difficult to beat. If you're only interested in sport, then the TomTom Spark 3 is worth looking at. It uses a wrist-based heart rate system and GPS to give you loads of data about your sports, while also supporting all-day activity tracking. There's also support for music via Bluetooth headphones (as long as buy the right model), meaning you can take music on your run without your phone. There's no smartphone support and TomTom's isn't as data-focused as Garmin's, but then the Spark 3 isn't as expensive either. The Garmin Forerunner 935 is a step above the 735XT, giving you more sensors, a more premium design, higher resolution graphics and a more logical layout to the user interface. It also gathers more data and gives you more advanced functions using this data, such as your ongoing recovery status. It's a wonderful watch, but it's also very expensive and might be more functionality than you need. A big display comes with a big feature list with lots of data gathered from Suunto's first wrist-based HR watch. Although it offers all the functions of the other devices on this list, it's no quite as reliable, as data syncing to the smartphone app can be very slow. It's also not the most accurate of heart rate trackers, but it does offer some great route tracking functions.